Whether you’re looking for a private retreat of your very own, somewhere for the kids to splash around during the summer or even a place to swim laps and keep fit, a concrete pool is the best option. 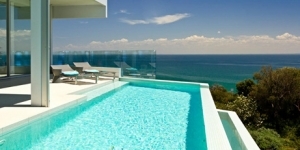 Hybrid Pools is committed to designing a pool that you love and that works with your property. These swimming pools are completely custom designed, so you can rest assured that they will suit the shape of your yard perfectly. We can create any shape that you can think of, from rectangular to free form. 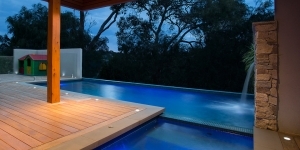 Our pools offer a wholly professional appearance thanks to our wide range of finishes. Choose from rendered to fully tiled interiors – each available in a variety of colours – ensuring that everyone’s needs are met. Live on a sloping block? No worries! 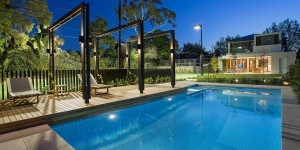 Pools R Us can even install inground pools on sloping sites – we work with the lay of the land, excavating and building up where necessary to ensure that the edges are level. 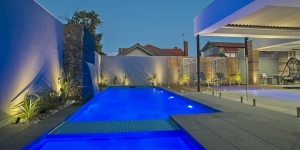 The great thing about concrete pools in Melbourne is that they are completely structural – they can be tied into an existing building and they can even be built on once our work is complete. Let us know what the overall plan is! 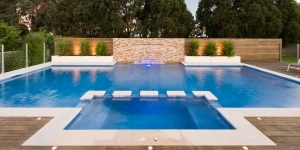 A representative from Hybrid Pools will come out to your home to inspect the site where you wish to build the concrete swimming pool. 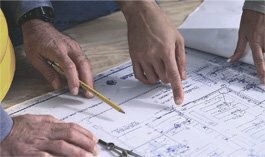 The completed designs will be sent to an engineer and we will help you to obtain any necessary permits. 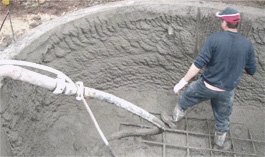 Once the plans have been approved and all permits are in place, we will come out to your home and begin staking out the edge of your new concrete swimming pool. The site will then be excavated to the required depth (if required). For inground pools, the steel that forms the outline is installed; for out of ground pools, the framework is erected. The pump, drainage and other systems are pre-plumbed. Finally, concrete is sprayed into the shell and it begins to take shape. 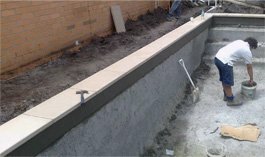 Our concrete pool builders leave the site to cure before your chosen finish is applied (tiling and rendering are popular) and the edges are completed (coping, paving and decking are popular). The shell can now be filled with water. How long will it take for my pool to be completed? 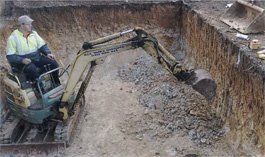 Once the excavation of your site is complete, it generally takes between 8 and 12 weeks for your project to be finished. The actual timeline will depend on the complexity of your design. What sizes and depths are available? 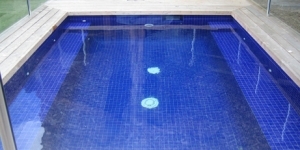 As these pools are completely customised, we can make them as big or small and as deep or shallow as you like. We have created large, family-sized shells and smaller lap pools – the sky is the limit! Can I add any special features to the design? For even more luxury, we are able to add spas and even water features to these inground pools in Melbourne during the design phase. How soon after installation can I use the pool? Basically, your swimming pool is ready to go as soon as handover is complete (this is when we explain how everything works). What sort of warranty is offered? Hybrid Pools offers a 7 year builders warranty on all our concrete pools in Malaysia for your peace of mind. 7 days a week from 7:00 a.m. to 7:00 p.m. Central time.